The Assignment: Score a classic interactive fiction. Deadline: This project’s deadline is Monday, December 3, 2018, at 11:59pm (that is, just before midnight) wherever you are on. It was posted shortly after noon, California time, on Thursday, November 29, 2018. Step 2: If you’re not familiar with Zork and/or with interactive text adventures, consider reading up. Otherwise, just think of the script as exactly that: the bare-bones narrative of a story. Bonus Alternates: (A) You can, of course, end sooner or later. (B) You can, of course, play the game yourself and score the moves you make. (C) You can, of course, sort out a means to record alternate, forking versions, based on various potential outcomes of different decisions when playing the game. (D) You might open with a brief opening-credits theme. 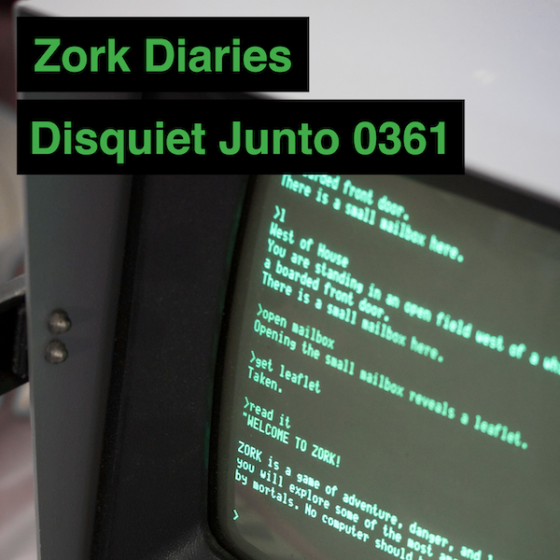 Step 1: Include “disquiet0361” (no spaces or quotation marks) in the name of your track. Step 2: If your audio-hosting platform allows for tags, be sure to also include the project tag “disquiet0361” (no spaces or quotation marks). If you’re posting on SoundCloud in particular, this is essential to subsequent location of tracks for the creation a project playlist. Title/Tag: When posting your track, please include “disquiet0361” in the title of the track, and where applicable (on SoundCloud, for example) as a tag. The payoff is a split-second filigree from a what appears to be a jazz piano trio. It sounds like the modest backing band to a quiz show or late-night talk show. The celebratory equivalent of a rim-shot, the sound in question is the little ditty that plays at the end of “The Mini” crossword, a daily feature on the website of the New York Times. I recently started doing the Mini in the morning, usually getting it done in under a minute (:54 today), sometimes a little over two minutes. Yesterday it took over 9 minutes, closer to 10. I might have just stopped trying, but I persevered, winding my way through various unfamiliar words — most sports-derived, if memory serves. If anything is going to flummox me, it’s sports-related information. I did take a short call in the middle of the puzzle, and neglected to hit pause on the Times site, so I can let that interruption account for perhaps two minutes of my extended linguistic struggle, brain slowly coming out of its slumber-fog. In the end the disappointment wasn’t that it had taken so long, but that I’d had the computer on mute, which meant that the jazz trio’s flourish never was heard from my laptop’s speakers. Games are games, so this user-experience ditty isn’t a matter of gamification, per se — of the application of game play to other types of activity. 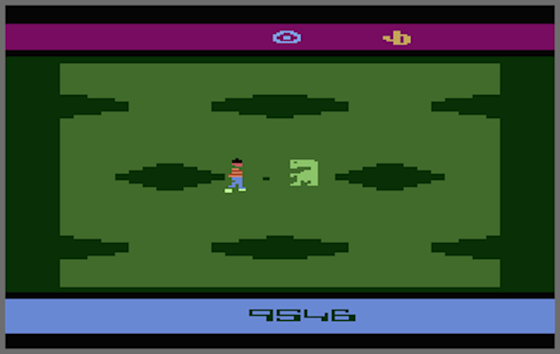 But it is a bit like “video-gamification”: the application of video-game elements to non-video games. Not getting to hear the riff after exerting so much effort provided a classic example of adding insult to injury. Tangents is an occasional collection of short, lightly annotated mentions of sound-related activities. Because you’ve ruled out music, maybe a comfortable set of noise-canceling headphones — tuned to nothing — would be enough to blunt the irritating sounds. Or you could consider any number of “white noise”generators that are available free online. Noisli.com, for example, generates forest sounds, coffee-shop noise and the like. You also could do a little research on “ambient”music and use a service like Pandora to construct a nondistracting sound stream. Such approaches may be inoffensive enough that you can simply play the sound at low volume from your computer — no earbuds required. I started thinking about this project after attending the first two meetings of Sunday Assembly Atlanta. There were several parts of the meeting where we did karaoke, and I was wondering whether there was another form of musical interaction ”“ perhaps even unique to the organization ”“ that we could do as a body. That got me thinking about new ways of looking at how music could be made and how it could be experienced. This “shared” instrument, as he calls it, involves PlayStation controllers, and he has posted the above audio recording of a nearly half-hour performance, which dates from the end of last month. The result is a kind of meditative game parlor, an arcade of reflection, the steady beat layered with an ever-changing amalgamation of colorful beeps and bloops, whirry static, and other largely percussive sonic elements. Track originally posted for free download at soundcloud.com/bryant-ohara. More on O’Hara’s project at intimateandintricate.wordpress.com. Create music for a fake movie whose plot is "Poltergeist meets Wreck-It Ralph." This project was published in the early evening, California time, on Thursday, May 1, with 11:59pm on the following Monday, May 5, 2014, as the deadline. These are the instructions that went out to the group’s email list (at tinyletter.com/disquiet-junto). This week’s project is fairly open-ended. The essential thing is that your music has an “8bit flavor” — define that as strictly as you wish. You will write the opening theme music for a movie that doesn’t really exist. The film is a horror flick. The elevator pitch of the movie’s plot is “Poltergeist meets Wreck-It Ralph.” The opening sequence involves a housing development being constructed on the site of a former city dump. The construction crew discovers the burial site of one million cartridges of the ET Atari video game. The developer decides to pour concrete over the ET cartridges and continue building. But something has been awakened. Hundreds of thousands of 8bit ETs cannot be kept down! Your music will accompany a film montage (again, this is entirely imaginary) covering the above description, which should last between two and four minutes. Deadline: Monday, May 5, 2014, at 11:59pm wherever you are. Length: The length of your recording should be between two and four minutes. Title/Tag: When adding your track to the Disquiet Junto group on Soundcloud.com, please include the term “disquiet0122-8bET” in the title of your track, and as a tag for your track.